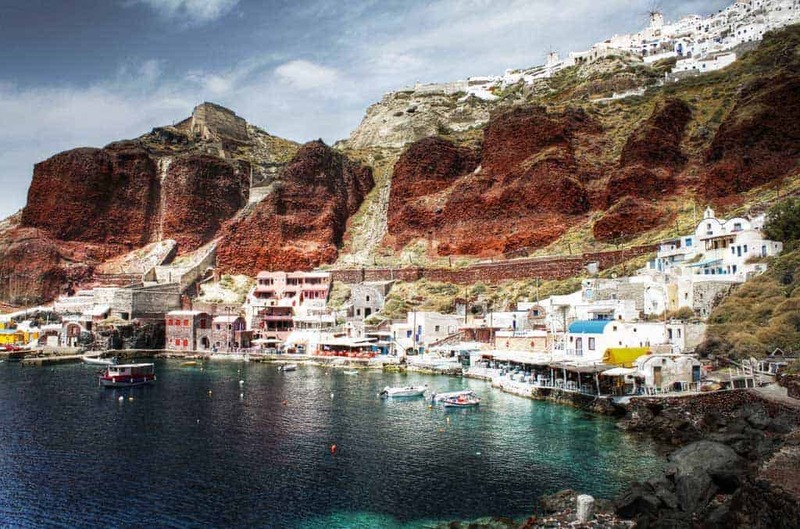 Ammoudi is found right up in the north west of Santorini beneath the popular town of Oia. It’s around half an hour from both Fira and the airport. Ammoudi isn’t really a village, it’s a small, charming harbour with a handful of restaurants a couple of places to stay and some bars, all set in spectacular scenery. The harbour is surrounded by volcanic rock which gives a beautiful red and white backdrop and makes it such an appealing place to spend a few hours relaxing or enjoying a meal and some drinks. There’s no beach in the harbour itself but there is one just off the main road that leads down to the harbour. It’s the usual black pebble beach that Santorini is famous for and there’s no facilities but it’s a welcome spot for taking a dip in the sea if the heat of the day gets too much for you. Ammoudi is accessible by car via the old stone mines or by foot from Oia, there are 214 steps between Oia and Ammoudi, getting down is easy but getting back up, particularly after a nice meal and some local wine is not so easy. Another popular thing to do from Ammoudi is to take one of the boat tours that are on offer from the harbour. They generally take you round the island and you get to see some of Santorinis stunning coast line. If you have photos from Sidari that you would like to share please use the form below to send them to us. Go to the Santorini resort guide to find out about the great towns and villages on the island. Go to the Santorini beach guide to find out about some of the best beaches on the island. Find something to keep you entertained whilst in Santorini with our Santorini sight seeing guide. Find information on another Greek island, whether that’s to hop from Santorini on a day trip or to research an alternative destination. We want Which Greek Island to be as accurate and informative as possible, so, if you notice anything wrong with this listing about Ammoudi or any other page please let us know. We’re also on the lookout for great photos to show people what the places we’re describing are like. If you have photos from Ammoudi or from any of the other places on the site then we’d love to see them, simply click the button below to go to the photo upload page. Thanks.